A bike room in an office building, parking garage, apartment complex or college dormitory is a great way to add secure indoor bicycle storage. The right bike room layout can ensure bike parking is easy, safe, and secure. Locate the bike room near an exit and avoid stairs or narrow hallways. Avoid layout obstructions such as pillars, doors, windows, utility access, and ceiling pipes. Locate the bike room near a floor drain for drainage. If the site is a large open space, like a parking garage or warehouse, consider building a smaller bike room, or bike lockers may be a better option. Provide both horizontal and vertical bike parking for maximum space efficiency and to accommodate different styles of bikes. The minimum recommended aisle width is 54 inches (4 feet, 6 inches). This provides enough space for one person to walk one bike. To accommodate simultaneous users, the recommended minimum aisle width is 72 inches (6 feet). Account for door clearance and entry and exit flows. Consider extra space for parking bikes with trailers. Limit access to the bike room to authorized users to increase security. Bike racks should enable the bike frame and wheel to be locked to the rack. Ensure the bike room has adequate lighting. Consider surveillance cameras for added security. Lockers for helmets, shoes, clothing. A Public Bike Pump and Public Bike Repair Stand to provide bicyclists a complete bike work station and encourage use. 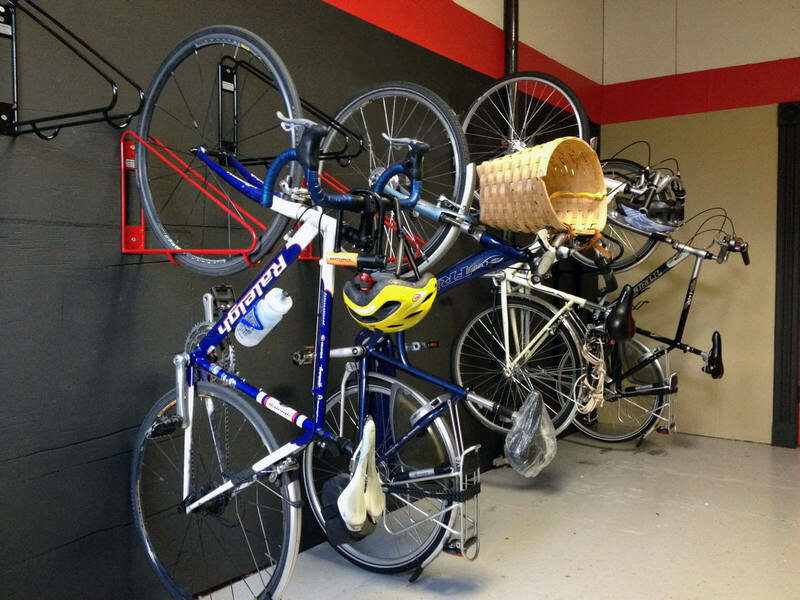 The Bike Wall Rack is a simple, space saving, and economical bike storage system. Designed to free up floor space, the Wall Rack parks a bike vertically against a wall. Simply roll the bike up to the rack by the back wheel and set the front wheel into the rack. Lock to secure both the wheel and the frame. Bike Wall Rack Stands can be used to create double-sided bike parking. CycleSafe U/2 Bike Racks accommodate two bicycles per rack securing both the wheel and frame. This increased stability helps prevent colliding bikes and is safer for pedestrian traffic aisles. For maximum capacity, the Hi-Density Bike Rack offers cost-efficient bike parking with two-tier capacity. Simply roll the bike along the channel provided to secure the wheel and bike frame in place. Each Hi-Density Bike Rack allows double-tier parking to hold four bicycles. The CycleSafe Bike Stall can store up to eight bikes per five foot section. Bikes can be placed at 45º angles to allow for wider aisles. A well-planned bike room is secure, convenient, easy to use, and an asset to any building. For help selecting the right bike racks or designing a bike room, please contact your Design Specialist at 888-950-6531.